Mark Kiker presents a half-dozen questions you hope never to hear from your manager—and how to react when you do. New Year’s Resolutions: Effectively Training the Masses — Kevin Sanders offers an approach to training geared to achieving ROI. Exploring Spaces in ACA — Melinda Heavrin helps you navigate Spaces in AutoCAD Architecture 2019 software. Please Don’t (Just) Blame the Tech — Kelly Cone takes a critical look at the AEC industry and challenges all involved to be voices for change. AUGI is committed to providing diverse opportunities for its members to further their education—Below are just a few of the educational offerings that AUGI currently provides to help its members sharpen their technical skills. 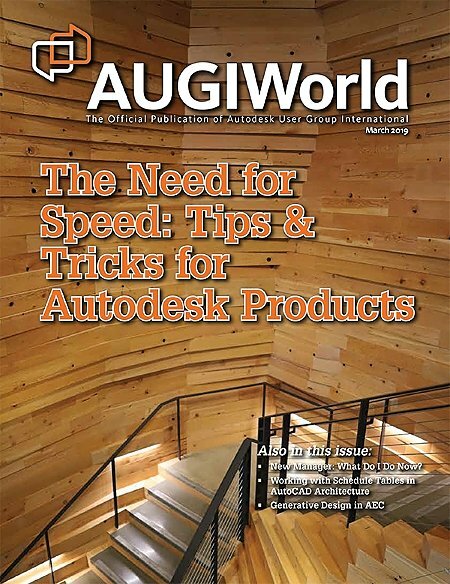 ©1990–2019 Autodesk User Group International, Inc. All Rights Reserved.